It’s sweet. It’s salty. 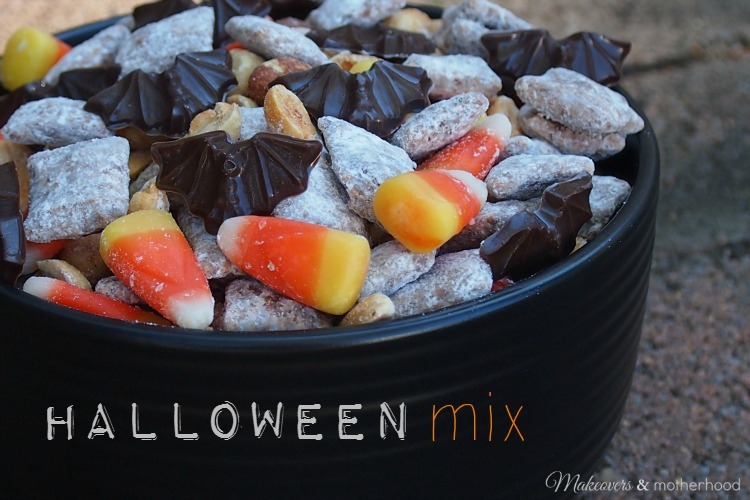 It’s Puppy Chow mixed with Halloween yummies your family will go batty for! I’m not sure what’s the funnest part of this treat… making it or the Halloween flair that it brings to snack time! All the steps are easy and it’s a fun way to get your kids cookin’ in the kitchen. With all the shaking and squeezing and pouring, you’ll not just be concocting a delicious Halloween mix, but you’ll be having a howl-ing good time doing it! Affiliate links included in this post for your shopping convenience. Now I know you’re super impressed with my little chocolate bats. And while I’d love to tell you that I’m nothing shy of brilliant making these little bat babies, it would be a complete lie. Honestly, the bats take one ingredient and only a few minutes to make. My mom and I whipped them up in about 5 minutes and in another 10 minutes, they were set up and ready to eat! Seriously, who doesn’t love a cute treat that simple? My usual recipes are laid out with a step-by-step printable recipe card, but I’m going to get all crazy up in here and break the mold so I can walk you through where to find your ingredients and supplies. The one ingredient you need is a confectionary coating melting chocolate. I chose a dark cocoa for flavor and chose to make the bats brown because I liked the coloring of it with the other ingredients. The options are endless though… milk chocolate, white chocolate, black, orange, etc. Go crazy and have fun with it! You will need three more supplies to make chocolate bats. The first is a chocolate candy mold. I purchased my mold at a local baking store that specializes in cake decorating and candy supplies. Unfortunately, my specific mold is not available anymore. However, to give you an idea of size, each bat was 1.25″. 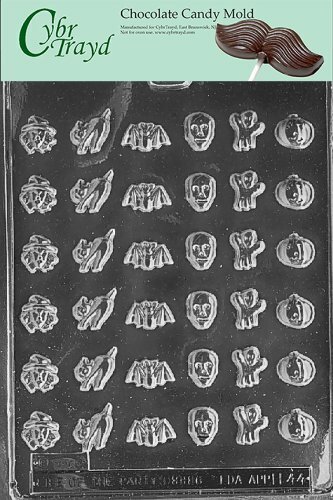 I did find this mini mold sheet of bats, cats, pumpkins, witches, ghosts, and skeletons on Amazon and absolutely adore it. They will scare up some serious oohs and aahs! Second thing you’ll need is a decorating squeeze bottle (super cheap… under $3 for 2 bottles). This is what you’ll use to get the melted chocolates into the mold. It controls the flow of the melted chocolate. And lastly… a toothpick. It can be difficult to get the chocolate into the tiny corners of the mold, but the tip of the toothpick is perfect to spread the chocolate into those little creases. Sounds tedious, but I promise it’s not! 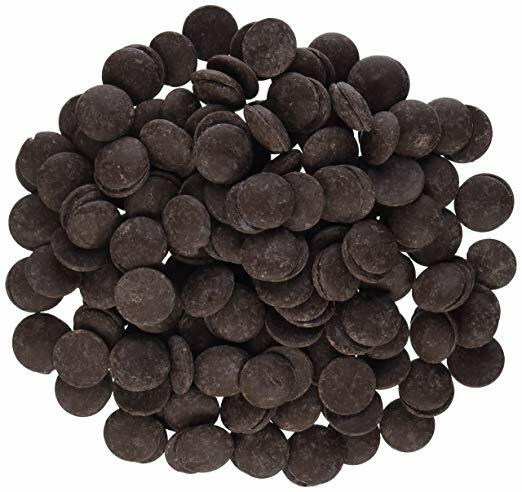 Once you’ve made your chocolates, place in the fridge or freezer to help them set up quickly. The Puppy Chow takes about 10 minutes to make it. So this is perfect while the chocolates are setting up. My Puppy Chow recipe, which was passed down from my MIL, is absolutely delicious. So much so that it deserved it’s own post. So I’m linking the recipe here rather than re-writing it. 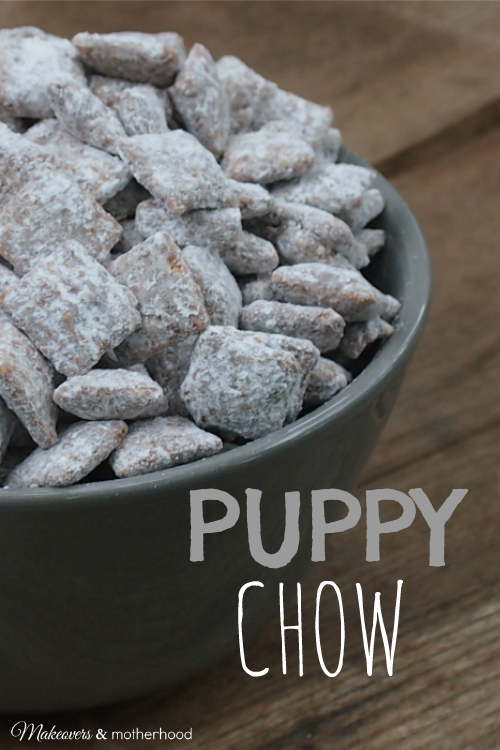 This way, you can Pin it and can have Puppy Chow all year round! 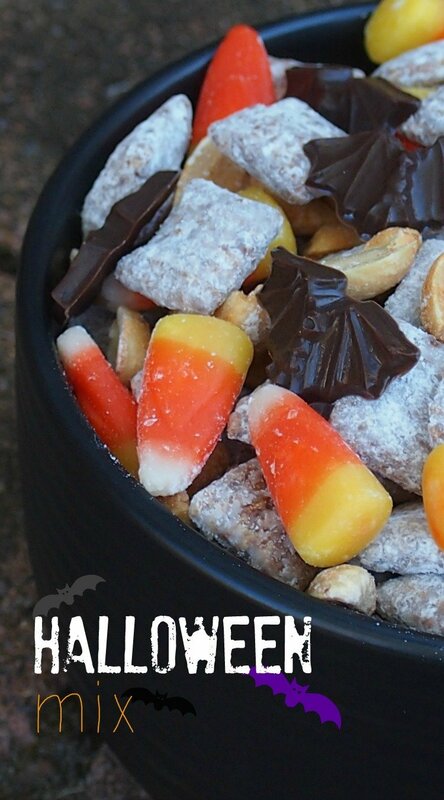 In a large bowl, combine Puppy Chow and desired amount of candy corn and dry roasted peanuts. Once the chocolates are firm, gently pop them out of the mold and add them to the mix. (If they don’t come out easily, try tapping the plastic sheet lightly on the counter top. Mine just fell right out this way.) Stir carefully as the chocolates may be brittle. Remember that presentation plays a big part in food fun. A contrasting color bowl will really make the colors of this boo-tiful snack pop! Do you have any hauntingly fun foods or Halloween traditions you enjoy? Please share in the comments below.